What Are Good Midnight Snacks for Pregnancy? 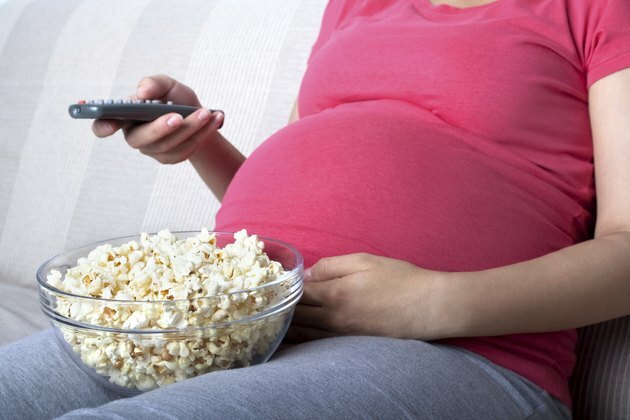 Although it's not healthy to overeat while you're pregnant, occasional snacks can actually be good for you. Satisfying your late-night cravings will help you get a restful night's sleep, and choosing healthy treats is an easy way to get more nutrients to your growing baby. Just remember to keep your snacks small, since eating a full meal at midnight will make you uncomfortably full. If you're dreaming of something salty and crunchy, choose popcorn. Make a bowl of light buttered popcorn and sprinkle it with shredded Parmesan cheese. If you like spice, add a dash of cumin and cayenne pepper. The protein in a handful of nuts will also satisfy your craving. Limit yourself to a 1/3-cup serving of nuts, however, since they contain lots of fat. If you're craving chips, melt a sprinkling of shredded cheddar cheese on baked tortilla chips and dip them in salsa. When you're craving something sweet, make it fruit. The fiber and protein in fruit will keep you full until morning, and the taste will satisfy your sweet tooth. Pour out a bowl of high-fiber cereal and skim milk and top it with mixed berries, or sliced strawberries and bananas. If you prefer a creamy snack, mix a cup of low-fat yogurt with a teaspoon of honey, a sprinkling of granola and the sliced fruit of your choice. On a cold winter night, a hot midnight snack will comfort you enough to send you back to sleep. Heat up a bowl of low-sodium soup. Choose a variety that's packed with vegetables, like minestrone, since the nutrients and fiber will be beneficial to your baby. To make a hot, salty pizza, cover an English muffin with tomato sauce, shredded cheese and sliced vegetables. Cook the muffin until the cheese is melted. A bowl of oatmeal topped with fruit will give you plenty of fiber and protein to keep you satisfied until breakfast. When you're sweating and stuffy, an icy-cold treat will cool your body down quickly. Skip the fatty ice cream and choose frozen yogurt or sorbet instead. Cover one scoop with chopped nuts and fruit or a drizzle of hot fudge. Popsicles made with real fruit juice are often so low in calories, you can enjoy two of them if one isn't enough. With a little advance planning, a chocolate-covered frozen banana is easy to make. Dip a freshly-peeled banana in melted dark chocolate and freeze it for an hour.